Orders placed on Jedzebel.com are shipped directly from Amazon warehouses and use priority Amazon shipping methods. We offer free shipping but cannot control the method used. Most orders are received very quickly and are shipped the same day the order is made. Refunds – Contact us within 14 days from the date of purchase to return an unused item for a refund, at your expense, for any reason. We will refund you as soon as we receive the item back and you will be refunded the purchase price of the item, but not your shipping expenses. Call us, or email us at [email protected], for a return authorization number before sending back your item. Please view our Return Policy page for more information. Note that RETURNS will be made to the Amazon warehouse but we will make refunds and price adjustments as needed manually on this site. To receive a wholesale catalog or an online password please call (888) 268-5326. You can also email us with our contact form. We offer our lines to qualified resellers who meet our wholesale conditions. Please visit our Wholesale page for more information. 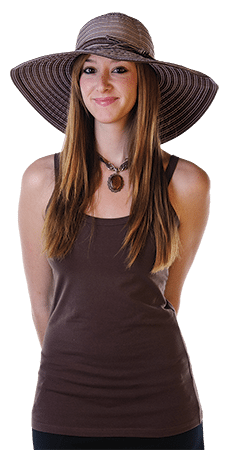 Jedzebel-EcoGirl-hat.a.girl supports the following charitable organizations with a portion of the revenue generated by sales from our Web site. You can select your choice of charity at checkout. Also, if you would like more information or to make a donation yourself please use the links below or the Charities link in the main menu. Fior di Loto Foundation – The Fior di Loto Foundation works with young girls in Rajasthan, India providing them with schooling which they were too poor to receive otherwise. In-house project : Land and home building for specific poor families in India where we do our work Here’s the link to our in-house GoFundMe.com campaign : Donate to Build a Home for Rakesh. Rakesh Bhopa’s home has been built and he is living there with his family. We have most recently supported him in a small business using traditional garments for tourist pictures.